Paros is a low-key Greek island and a nice place to visit. It's easy to get to Paros, as it and Naxos are transport hubs of the Cyclades island group. The island is large enough to support some agriculture, although not as much as the nearby much larger Naxos, famous across Greece for its potatoes. 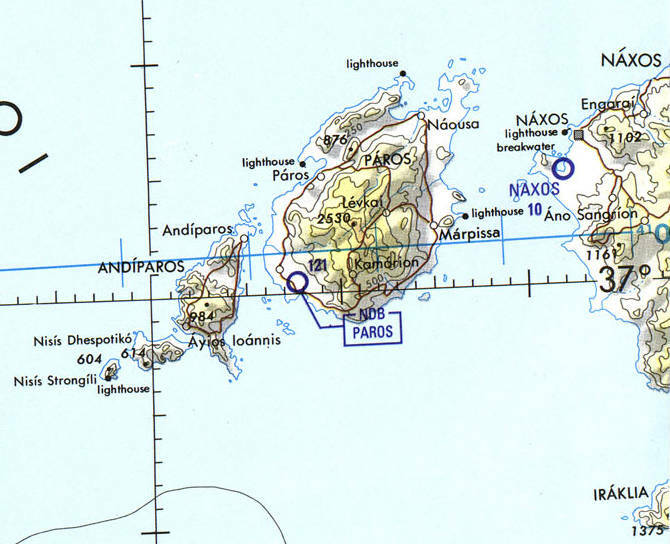 The below map shows Paros' location between the orange pointers. 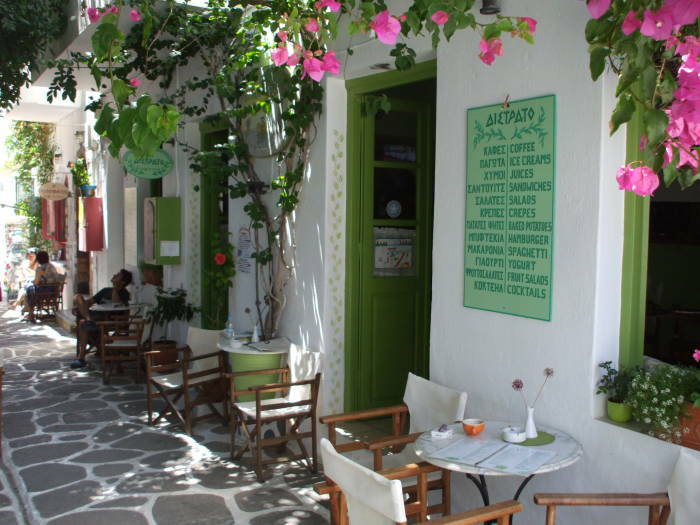 Paros is three and a half hours by fast catamaran and six hours by traditional ferry from Piraeus. Mykonos and Ios are about 90 and 50 minutes away by fast boat, respectively. Paros is in the center of the Κυκλάδες, the Cyclades, the islands around the sacred island of Delos. The Cyclades islands are mostly the peaks of submerged mountainous terrain, with the exception of the two volcanic islands of Milos and Thera (Santorini). 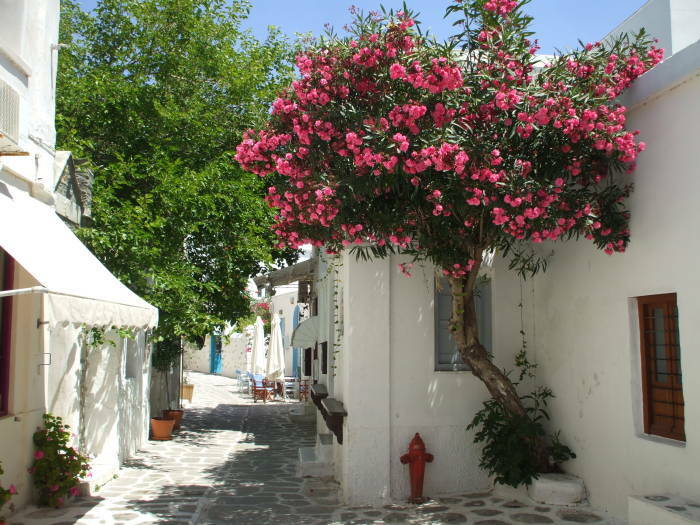 Paros is one large mountain extending out of the Aegean, largely made up of white marble. The central peak, Moni Profitis Ilias, is at 771 meters. Map of the Greece and the Aegean Sea. Πάρος (or Paros) is between the orange pointers. Here is a handy Paros starter's guide. 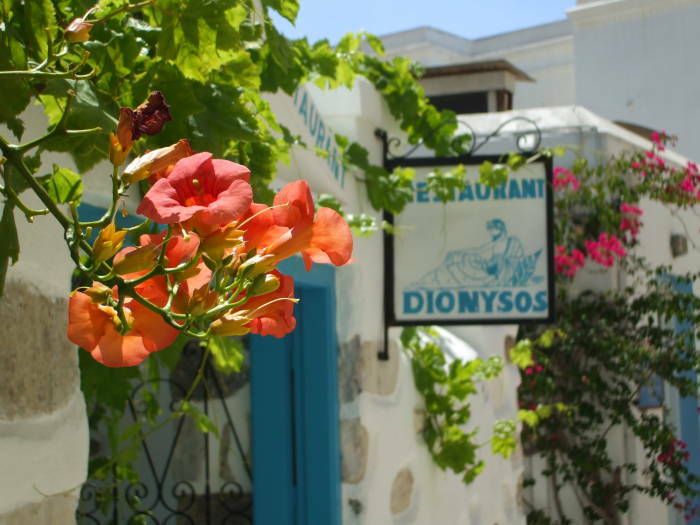 On most of the smaller islands, the primary town is simply known as Hora, or Χορα. 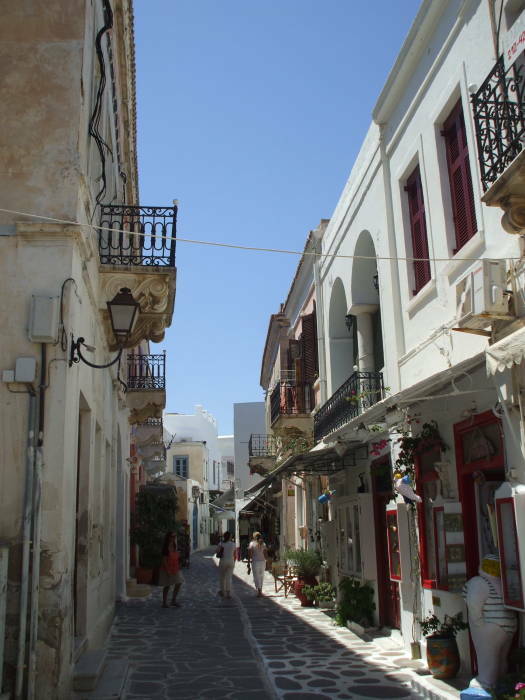 Paros is large enough that its main town and port is Parikia. This map shows the town as Páros, although Parikia (really Παροικιά) is the modern name. Aeronautical chart of the Aegean Sea. Original full resolution map available here, from the University of Texas' Perry-Castañeda Map Collection. Paros was famous throughout history as a source for translucent white marble marble. The Venus de Milo and other classic sculptures were made from Parian marble. 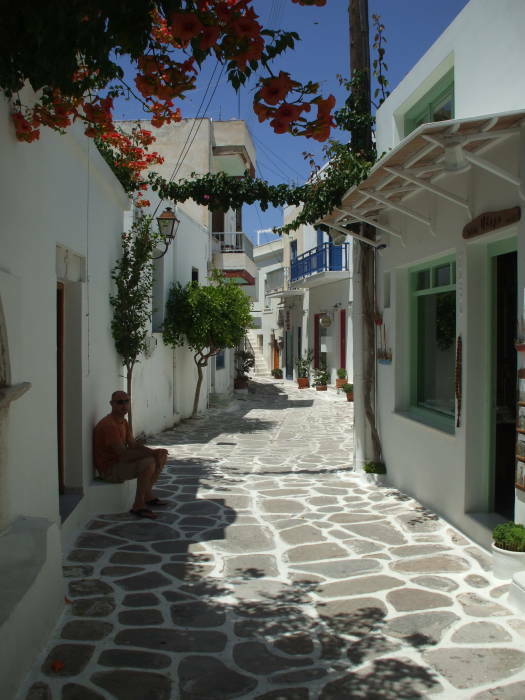 Paros exhibits the classic Cycladic architecture: white roughly cubical buildings with blue trim, and windmills. 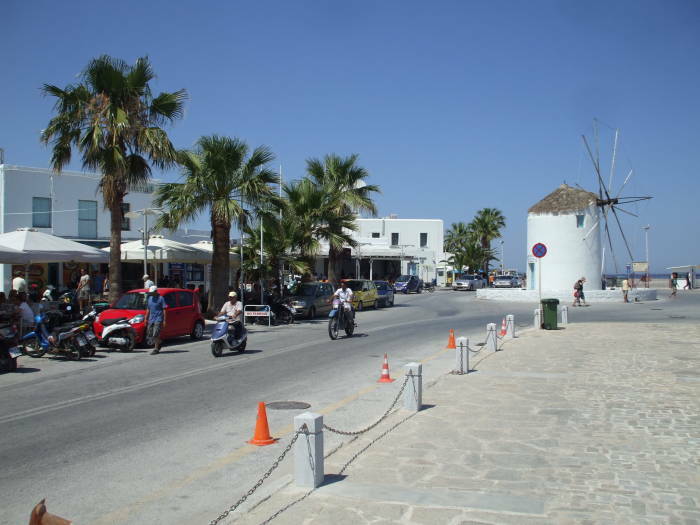 One windmill is right at the waterfront, in the main traffic roundabout next to the port of Paros. Windmill on the waterfront at the Paros port. Small church near the port on Paros, with Moni Profiti Ilias (or Mount Elijah the Prophet) in the background. Paros has been inhabited for a long time. Today's country of Greece hasn't always been one nation or at least a cohesive alliance. That has led Paros' inhabitants to make some military choices that might seem surprising. Paros sided with the Persians in the first Greco-Persian war in 492-490 BC, sending a trireme to Marathon to support the Persians. An Athenian fleet later besieged the capitol for 26 days in retaliation. Then, in the second Greco-Persian war of 480-479 BC, Paros again sided with the Persians, supporting the shahanshah Xerxes I of Persia. The Athenian military leader Themistocles later heavily fined the island for their support of the Persians in this second war. The Delian League was a naval confederacy dominated by Athens, based at least nominally on the sacred island of Delos, near Mykonos. Paros seems to have been one of the wealthiest islands in the Aegean, based on its paying the highest tribute of all island members. The Cyclades islands came under the influence of the Ptolemiad dynasty that ruled Egypt over 305-30 BC, established by a general of Alexander the Great. They then became part of the Roman Empire, and then the Byzantine Empire. The Fourth Crusade sacked Constantinople and overthrew the Byzantine Empire in 1204. The Cyclades islands became the Duchy of the Archipelago, ruled by a Venetian duke and a client state of the Republic of Venice. The Venetian Duke of Naxos then handed out control of various islands to his relatives and friends. The Ottoman Turks took Constantinople in 1453, making it their new imperial capital. Hayreddin Barbarossa, the Grand Admiral of the Ottoman Navy, captured the Cyclades for the Ottoman Empire in 1537-1538. All these details are from "Depopulation in the Aegean Islands and the Turkish Conquest", F.W. Hasluck, The Annual of the British School at Athens, vol 17 (1910/1911), pp 151-181, citing earlier writings. For the most part, the Ottomans largely left the administration of the islands to the existing infrastructure of Venetian noblemen. However, Paros resisted Barbarossa in 1537 and he removed 6,000 islanders as prisoners. The population recovered quickly, apparently due to colonization from northern Greece. At least in 1910, the Parians were said to speak a North Greek dialect. 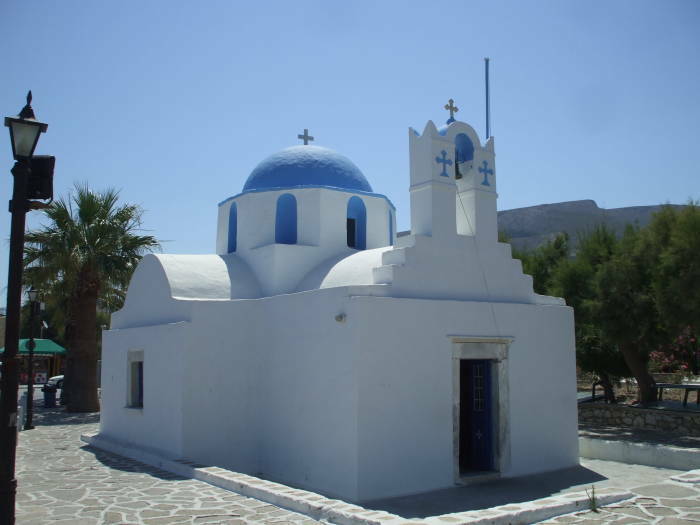 The Panagia Ekatontapiliani, or the Church of the Hundred Doors, is the principal church of the town of Parikia and the entire island of Paros. The church, as an organization or congregation, dates to 326 CE, and it is claimed that it was founded by Helena, the mother of Constantine the Great (ruled 306-337), on her way to the Holy Land. The island had its own bishop by 431. Its oldest physical structures probably date from before the establishment of Christianity as the state religion of the Byzantine Empire in 391 CE. Justinian (who ruled 527-565) is credited for starting some of the later construction. 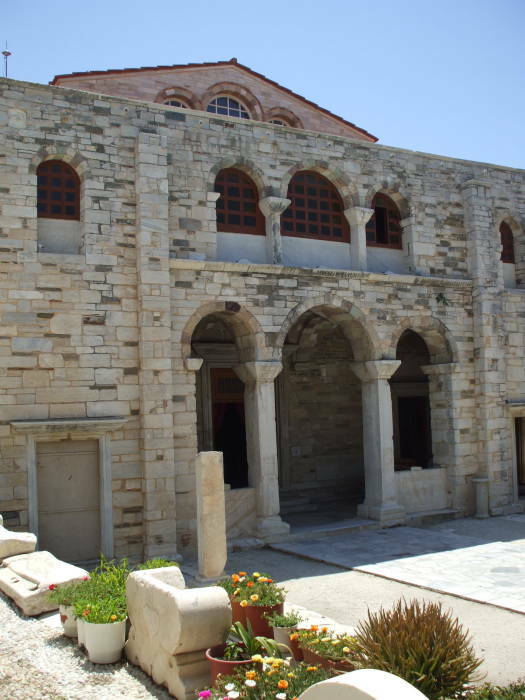 Façade of the Panagia Ekatontapiliani, the Church of the Hundred Doors. Iconostasis of the Panagia Ekatontapiliani, the Church of the Hundred Doors. No surprise, the interior is largely white Parian marble. 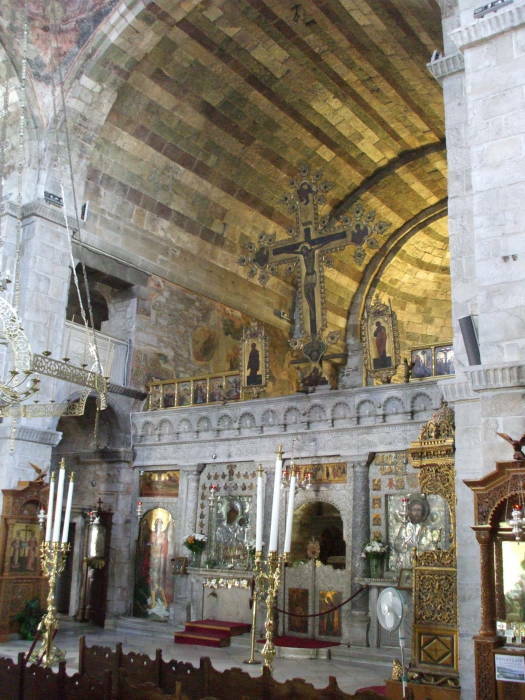 This includes the Iconostasis dividing the nave from the altar area. An iconostasis is built and decorated following a a very specific design. The row of icons about eye level to either side of the central doorway is called the worship row. The icon to the right of the central door shows the saint or the event of the church's dedication. The icon to the left typically shows the Panagia, a specific pose of Mary with the infant Jesus. If there are icons on the doors, typically they show the Annunciation at the top, then the four gospel writers below that. Above the central door is the place for the Communion of the Apostles. Then, at least in some larger churches, there may be four rows of icons spanning the entire iconostasis above the doors. The first is the Deësis (or prayer or supplication) row, with Christ in Majesty or Christos Pantocrator at the center. He is flanked by the Virgin Mary and John the Baptist, with archangels Michael and Gabriel flanking them, and other saints spreading to either side. Here, it seems that the Deësis row is the only one, with a crucifix instead of an icon of Christ in Majesty or Christos Pantocrator. For further details, see the paper "Icons in Theory and Practice" by Margaret E. Kenna, History of Religions, vol 24, no 4 (May 1985), pp 345-368. Also see the book The Meaning of Icons by Leonid Ouspensky and Vladimir Lossky, St Vladimir's Press, 1982. The second row up would show the great liturgical feasts, twelve or so depending on the size of the iconostasis. The third row up would show the Virgin of the Sign (Mary with both hands raised in prayer, with a circle on her breast showing Jesus with his right hand raised in blessing) at the center, with Old Testament prophets extending out on either side. The top row would show the icon of the Hospitality of Abraham (the three angels who visited Abraham at Mamre, sometimes called the Old Testament Trinity) with the Old Testament patriarchs from Adam to Moses on either side. OK, that's enough church history. 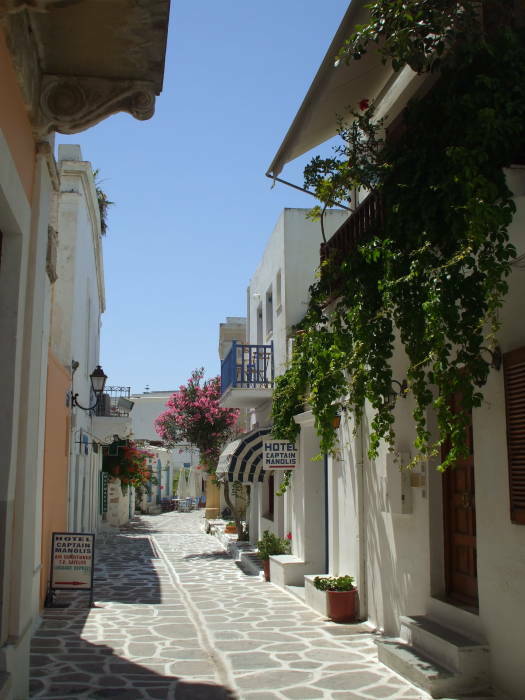 Let's wander the back streets of Parikia! There are some remains of the 13 Century Venetian kastro, or fortress, surrounded by narrow streets. There are plenty of pleasant places to get a meal, a snack, or a drink, and just hang out. 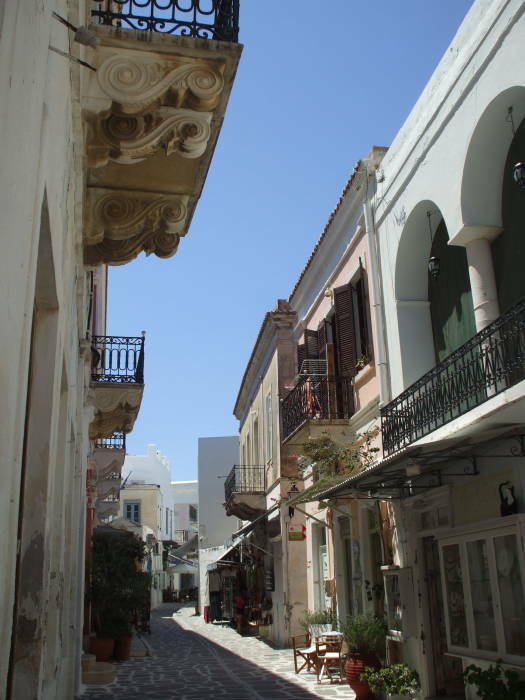 Many of the buildings in Parikia are built with white marble trim, like the balconies seen here. Businesses in Parikia built with Parian marble. There are flowering vines all through Parikia. In some areas they grow across overhead latticework and completely shade the passageways and small plazas. Flowering vines over a back street in Parikia. High-speed ferry unloads and loads vehicles and passengers. 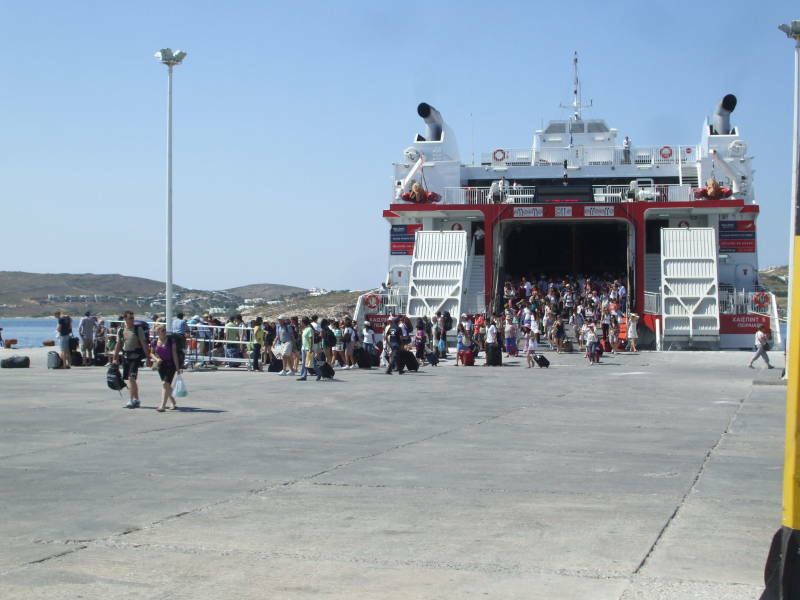 There is frequent ferry service in and out of Paros. Tickets are sold from an office across the traffic circle from the port entrance. You can buy a ticket and then store your bag until time to go to the dock for the ferry. You have to be there on time, as the ferries make very fast port calls. Sometimes no more than six minutes elapses from when the ferry's ramp first touches the pier until it lifts off as the ferry pulls away. The Rooms Association office right at the port entrance can arrange a room for you.